The key to a successful social engineering engagement is trust.If you are able to win the trust of someone else easily then you can obtain any information you want.Also people are suspicious when they don’t know someone and they are not so open when you are going to ask for something about them or their company.However if you have done your research and you are giving them information that have valid grounds then you might be able to convince them and win their trust faster.In this article we will see how we can create a profile for someone who we don’t know. 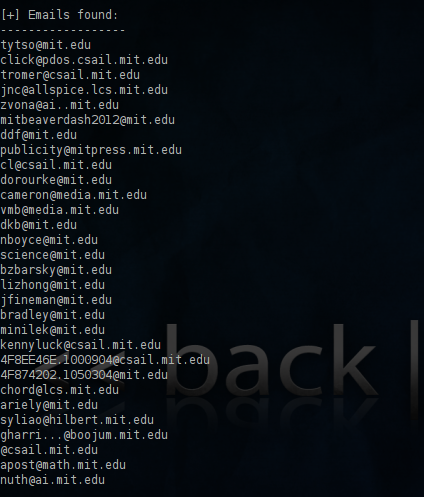 Let’s say that our client is the MIT(Massachusetts Institute of Technology) and we don’t have any information about them.As a first step is to discover email addresses and profiles that exist on social media networks.We have two options in this step.We can use either the tool theHarvester or we can use the metasploit module called search_email_collector. The use of the email collector module of the metasploit framework is pretty simple.We just need to set the domain of our target and it will automatically search through Bing,Yahoo and Google for valid email addresses. Our target in this case is the MIT so the domain that we want to set is the mit.edu.Below is a sample of our results. From the other hand the tool theHarvester is providing us with more options.So except of the fact that we can scan for email addresses,we can scan also for profiles in social media like Google+ and Linkedin.In the next image you can see the command that we have executed in the tool. Below is a sample of the email addresses that the tool theHarvester has discovered.Of course we can combine the results with the module of the metasploit if we wish. 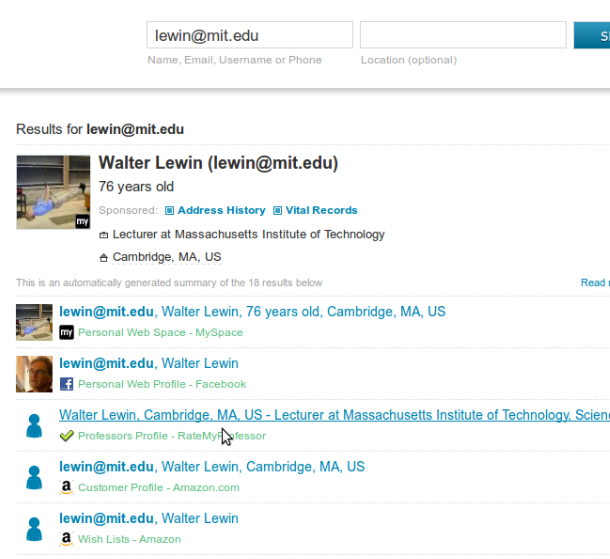 We can try also to scan for profiles related to the mit.edu into professional social networks like Linkedin.We have discovered 2 profiles. 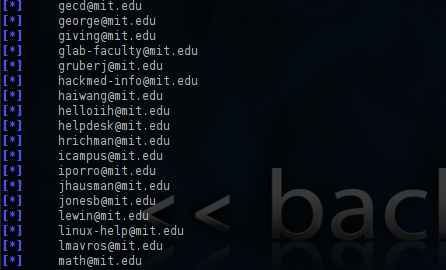 So we have a lot of email addresses and two names.Comparing the results with the metasploit module email collector we have identify that there is an email address that is probably corresponds to the Walter Lewin profile.The email address is lewin@mit.edu and you can see it in the results below. Now that we have a name and an email address it is much more easier to search the web in order to collect as much information as possible about this particular person.For example we can start by checking his Linkedin profile. 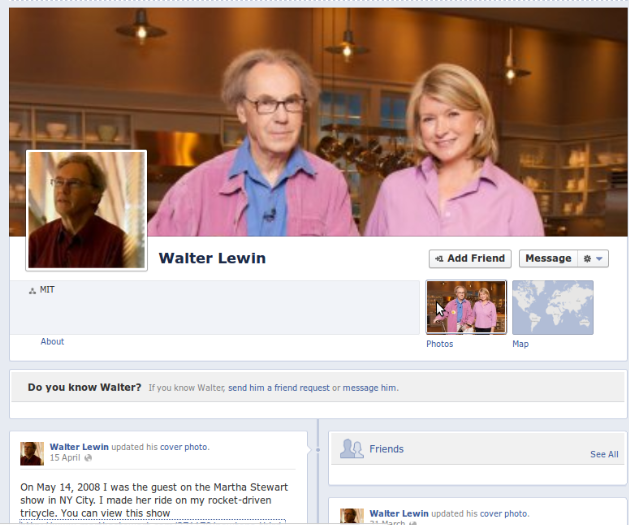 We can use the email address lewin@mit.edu to discover his Facebook profile. The information that we can retrieve without being friends on Facebook with is limited.However if we impersonate ourselves as a teacher of MIT we can send a friend request and we might be able to convince him with this way to add us to his friend list so we can have access to much more personal information.Another good tool for obtaining information is through the website pipl.com. As you can see we have discovered information about the age,the job,the personal web space,his Amazon wish list and a website that contains the profile about this professor.Also from the same search we have manage to find his work phone number and his office room. 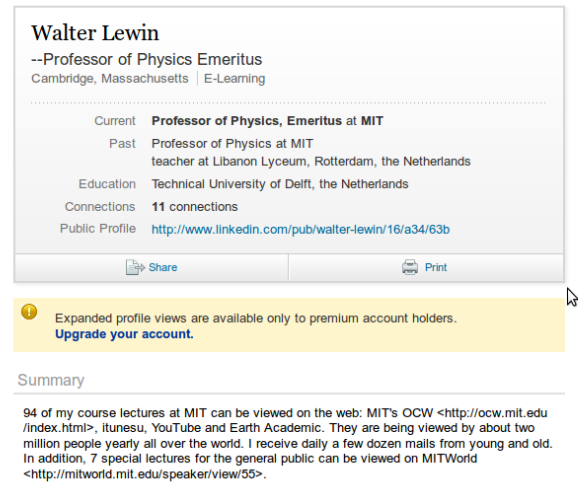 We can verify the above details by simply discovering his personal web page of the MIT. From the above image except of the phone numbers and the addresses we have discovered also and the assistant of this professor.This can help us in many ways like:we are sending him an email pretending that it comes from his assistant.The professor will think that it came from a person that he trusts so he will respond to our questions more easily. Basically the idea when constructing a profile of the person that you will use your social engineering skills is to have as much information as possible about his interests and activities,his friends and colleagues,emails and phone numbers etc.Keeping all that information on your notebook will help you to construct an ideal scenario that will work. Exposure of personal information is an advantage for every social engineer guy.Every information that you will post on the Internet eventually it will stay forever.So before you post something personal think twice if it is really necessary to allow other people to know about my self and my activities.Also using different email addresses and usernames will make the work of social engineers much more difficult. 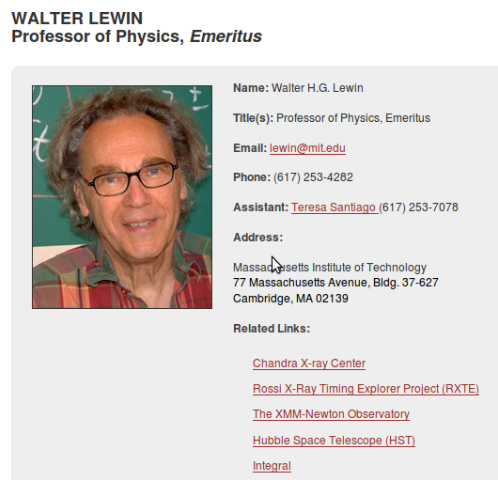 Pentestlab appreciates highly the professor Mr. Walter Lewin and respects his work and contribution to the science and doesn’t encourage in any way his readers to use this personal information in order to perform illegal activities against this person.